The months of February, March, April and may 2018 will be dedicated to the cinema! 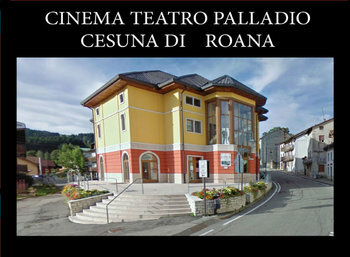 The Cinema Teatro Palladium of Cesuna, theAssociation Container provides a rich programming with some of the most beautiful movies in cinema history. There will be several thematic exhibitions devoted to different themes, authors or genres: the lunadicharlie Festival with films of Charlie Chaplin, the martedifanta review of science fiction , the timeless, the women, the filmresistenti and the primomaggio. All screenings will start at 20.45. 7, 8, 9 March-exhibition "in feminine"
Film shot in black and white, low cost, it became a cult film and is remembered as one of the most famous science fiction movies of the 1950s science fiction film and cited as one of the masterpieces. Dr. Miles j. Bennell tells his colleague Dr. Hill a hallucinatory story. The town of Santa Mira was invaded by extraterrestrials who copy perfectly the inhabitants which are substituted during sleep. These creatures are replicating within huge pods that grow until they create copies without feelings and delete the originals. Charlot is a worker in a factory; his job is to tighten the bolts in an assembly line. Repetitive gestures, rhythms, inhumane and depersonalizing of the Assembly undermine the reason for poor tramp. The film is based on the popular novel by h. g. Wells the time machine of 1895, although part of the storyline was adapted to the needs of the U.S. company of 1960. The film is considered a classic of the genre. Late nineteenth-century England, on the eve of new year's Eve 1900, an inventor, George Wells, builds a time machine and tries to convince some notability of his own discovery. Story of a thief of books (The Book Thief) is a 2013 movie directed by Brian Percival, starring Sophie Nélisse, Geoffrey Rush and Emily Watson. Archive Manager of Scripture popular at the Fondazione museo Storico del Trentino, for which he edited the series "war Writings," edited by the historic War Museum of Rovereto, was founder of the journal "Materials of work". Presents an evening Dr. Nicolò da Lio, research fellow at the University of Padua which deals with history of military institution and history of societies at war. Ludovico Massa, said Lulu, is a 31 year old worker with two families to maintain (a composed by ex-wife and their son, the other from his new girlfriend and her son) and backed by 15 years of work already at the factory's , two paint poisoning and an ulcer. Malaki , overscheduled and supporter of piecework, thanks to which, working at infernal rhythms, unable to earn enough to afford the car and other consumer goods. I cento passi by M.T. Giordana. May 22- Exhibition "in feminine"
The reconstruction of the hundred days of General Dalla Chiesa as Prefect of Palermo. Winner on terrorism, is sent to Sicily to defeat the mafia. Stmpegna with his usual energy, but the Government leaves only, full powers are required do not arrive, the obstacles are multiplying. is the 1984 and misses very little to the launch of the first Macintosh. Then it will be the turn of NeXT in 1988 and the iMac in ' 98. Escorted by his right-hand man, the most faithful Joanna Hoffman, backstage that changes with the changing decades and customs, Steve JObS take on last-minute disruptions.